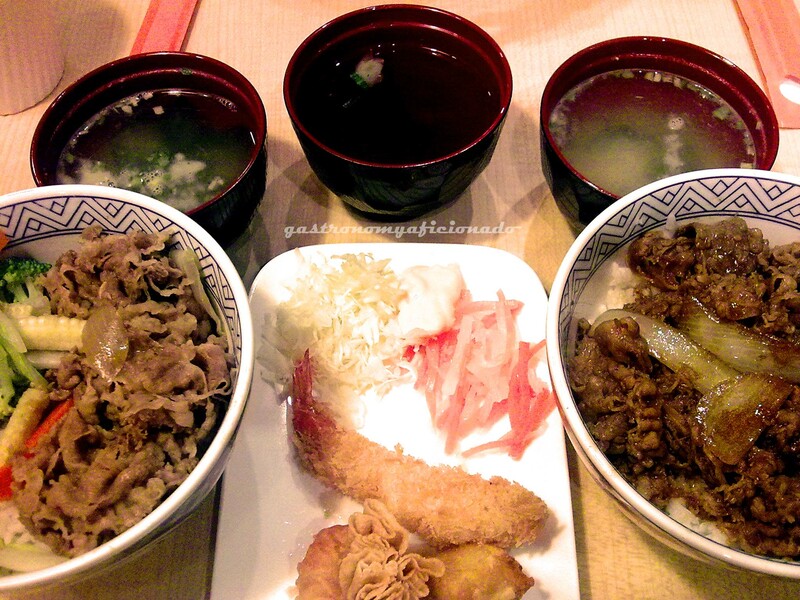 Left: Veggie Original Beef Bowl, Right: Yakiniku Beef Bowl, both alongside with Miso Shiru, Japanese Clear Soup, and deep fried seafood Side Dish. The 111-year-old Japanese beef bowl fast food chain from Japan, Yoshinoya, revives itself again in Indonesia and already made the plan for the second outlet in Jakarta. After its withdrawal when the Southeast Asia crisis strikes, Yoshinoya is indeed making a spectacular return. I have been visiting the outlet in Grand Indonesia Shopping Mall for several times last week and people still queuing for the beef bowl day and night, weekday and weekend! The queue probably not as intimidating as those in Japan (when the ‘Beef Revival’ event or when they’re changing the beef into pork for good before the revival), but surely you gotta queue for at least 15 minutes before you can order you beef bowl. Judging from their original Japanese motto. ‘Umai, Yasui, Hayai’ (Tasty, Cheap, Fast). You’ll see the price tag for regular size of original beef or yakiniku beef bowl is around IDR 25,000. It’s already added with miso shiru or Japanese clear soup. Your choice. For that price, Yoshinoya’s beef purely came from USA Beef 100% solid, using premium Japanese short-grain rice, and 111-year-old secret recipe. Aside from the beef bowl, you can also try the combo set that consists of chicken teriyaki, vegetables, and original beef. Also the crispy chickens like KFC and free flow ocha. Those made the beef bowl fantastically delicious thanks to the secret recipe and the premium ingredients. Especially for the yakiniku beef bowl since Indonesian tongue may be more familiar with the savory taste. As for the original beef, it’s actually good as well but perhaps not sharp enough for our senses. At any rate you should try the vegetables. It’s gonna remind you of Chinese capcay dish. As for the Grand Indonesia outlet, I think that the place is not adequate or cozy enough for you to enjoy the dish more. The dishes are definitely without doubt tasty but some things from the restaurant itself that made it harder to digest. First of all, it’s a very open restaurant and that makes it crowded with passersby and with the fountain show of Grand Indonesia especially also when there’s live music on the plaza there. Next would be the seat order. I was impressed with how Pepper Lunch works on the efficiency of order, seating, and serving. The waiter would give you your table number first based on how many persons having the dine-in and then you can order, afterwards all you gotta do is to wait on your table. But not in Yoshinoya, first of all you gotta queue which is okay since it’s understandable, but after we order our dishes we need to wait on the counter first and bring our food by ourselves. The most trivial from all is to find your table. Nobody to guide you and you gotta pace back and forth to find it because the dining area is separated into two by the cashier counters. Luckily, in one occasion or when the rush hour time, the native Japanese supervisor will be the one who’s doing the pace back and forth which I think is a waste of energy since they can actually make it more efficient by learning. At least they have assigned a waiter to write up what the queuing customers want in a small piece of paper so that when it’s their turn to come to the counter, they only have to hand it over. No more asking about this and that, no more thinking, just hand it over and wait for the dishes. So we can actually wrap it up. Great food, cheap, but not that quick, and inefficient system of order, seatings, and don’t expect a warm or easy atmosphere. It’s a goddamn flea market there and this is like any other fast food chain around the world. Don’t expect too much about getting comfy or anything. You gotta do everything on your own. Lucky the food was great, the taste was very original, and definitely cheap for hearty Japanese dishes. Thanks for coming back, Yoshinoya. It was great, really! you dont have to queuing for yoshinoya in japan. and the menu, its a whole different thing, though i think i`ll actually will like the indonesian version. AGREE!! Though at first skeptic bout the plc (thinkin it gained cust.by cheap price), the beef bowl turned out to be great! Smokey aroma from the beef,attracts appetite. Btw, clubsandwichindonesia.com? Can you tell me more about it? It’s interesting.